Download all the subject wise UP Police Fireman Previous Question Papers from this article. Furthermore, these UP Police Fireman Model Papers helps you to improve your logical skills and also time management skills. The officials of the Uttar Pradesh Police Department are planning to conduct the Fireman Examination in the month of March 2019 tentatively. So, candidates who have applied for the recruitment need to download the given UP Police Fireman Previous Year Question Papers. Well, all the eligible candidates can find the latest UP Police Fireman Exam Pattern, the UP Police Fireman Selection Process 2019 that was clearly mentioned by the officials of the Uttar Pradesh Police Department on their official site @ uppbpb.gov.in. We have even furnished this page with the direct download links to get the subject wise UP Police Fireman Model Papers in PDF format for free of cost. Start preparing for the test with all the documents or materials provided here. Candidates can find the latest UP Police Fireman Selection Process 2019 from this section. Also, the officials of the Uttar Pradesh Police Department will only hire suitable candidates through the below procedure for the 2065 Fireman Posts. So, to get into that process, you must qualify the written test initially. Furthermore, there are only 3 rounds in the उत्तर प्रदेश पुलिस विभाग Fireman Selection Process 2019. By checking this section, candidates can easily identify the latest uppbpb.gov.in Fireman Exam Pattern 2019. Also, we have gathered the exact details of the UP Police Fireman Exam Pattern 2019 from the official site and kept them in the tabular form as below. So, do check the table to get the correct information. It gives you the name of the subjects, the number of questions for each section. Along with them, we have also attached the total marks allocated for the upcoming examination. Moreover, the officials of the Uttar Pradesh Police Department have announced that the examination will be tentatively held in the month of March 2019. At present, the Uttar Pradesh Police Department is planning to recruit suitable candidates into their organization by releasing the UP Police Fireman Recruitment 2019. Moreover, many of the contestants are showing their willingness for these Fireman Openings due to heavy vacancies. So, all the applicants who are waiting to make their career into the Uttar Pradesh Police Department need to check the complete UP Police Fireman Model Papers article and then start preparing for the examination. Also, we all know that “Practice Makes Man Perfect” so every participant needs to be much bold enough to prepare and practise all the questions given in the UP Police Fireman Previous Question Papers PDF’s. Furthermore, we have also furnished you with the frequently asked questions and answers from the past years in these UP Police Fireman Model Papers. Therefore, click on the below links and get the UP Police Fireman Previous Year Question Papers for free. Solve as many papers as you can. Below are the direct links to get all the subject wise Uttar Pradesh Police Department Fireman Sample Question Papers PDF’s. So, candidates must and should utilize them for their best preparation. 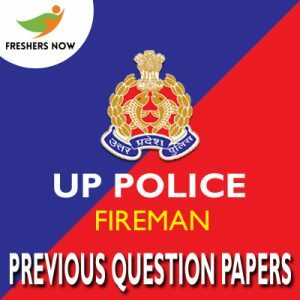 Well, we hope that all you will start preparing for the examination by downloading the UP Police Fireman Previous Question Papers from the above links. So, stay tuned to us only on our Freshers Now page.